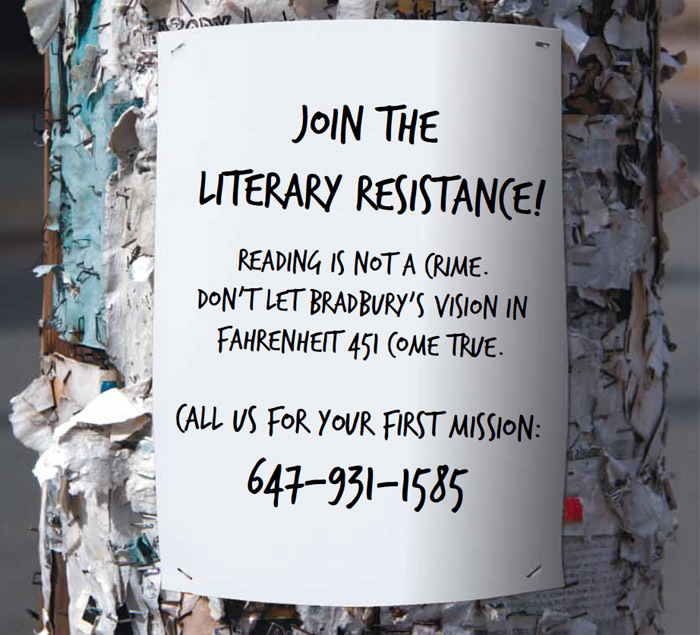 I love independent creators, libraries and integrating alternative media into library collections and programs, so when I heard about the Toronto Public Library’s new game created to accompany Keep Toronto Reading and themed around TPL’s “One Book” — Fahrenheit 451 — I was excited. I was most excited when I heard it was created by Jim Munroe. I know Jim through my work at Broken Pencil magazine, and his many endeavours including No Media Kings, video game arts group The Hand Eye Society and his various books, films and video games. Given Jim’s interests and activities, it wasn’t surprising to hear that he was behind KTR 451, a game that asks library patrons to call a number and follow instructions to take part in an alternate reality game (ARG) — which Jim describes as “part scavenger hunt, part audio drama.” The voice on the other end asks you to find books in the library and participate in a science fiction story that will continue until it culminates in a live event on April 22. I talked to Jim about how he got involved with TPL, why he thinks games are an important addition to the library and how other systems might attempt a similar project. How did you get involved with the Toronto Public Library on this project? Jim Munroe: I was chatting with them about a potential partnership with the Hand Eye around International Games in Libraries Day. There wasn’t enough time to get that together for last year (this year looks likely though), but at the end of the meeting they mentioned they were thinking about something interactive, maybe even a game, for Keep Toronto Reading. When I heard what book it was — Fahrenheit 451, probably the biggest reason why I write sci-fi novels myself — then I begged to pitch something to them. So I showed them two possibilities, an interactive ebook prototype and an ARG, and we decided to go with the latter. Why do you think media such as this is an appropriate undertaking for a public library? JM: From the library’s perspective, it’s a different method of engagement. I hope that it’ll explore the books themes in an interesting way and get people into the library (physically and otherwise). How did you go about putting this together? JM: I’ve designed about a dozen games, and one that also integrated audio drama, so the basics were pretty straightforward. I had to learn some new PHP and internet telephony tricks. I had weekly check-ins for a few months with the TPL so they could [give] feedback, and at the end I had several playtest sessions with strangers in libraries. What advice do you have for people who want to get their home libraries working on projects like this? JM: As far as advice, I would say that you kind of have to start with an open minded library system. If they’re looking to expand their programming and believe interactive has cultural value, then that’s a good starting point. The TPL has been amazing to work with in this regard. KTR 451′s first mission is available until the end of the day and then the second mission begins on Monday, April 8th. For more information about Jim’s other projects, or to put him in touch with your local library, you can find him over at No Media Kings.